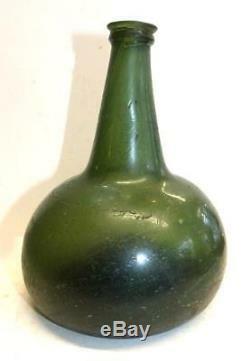 EARLY 18TH CENTURY DUTCH BLACK GLASS "ONION" WINE BOTTLE. A Dutch black glass "Onion" wine bottle with all the usual characteristics that make this form so appealing. It is slightly asymmetrical, with a graceful neck, flaws in the glass, a deep pontil, and funky top. The color is a good rich green. The surface shows the effects of scouring in the elements. It is 7 1/4" tall by 5 1/2" in diameter. Books will be sent Media rate in the US, unless otherwise requested. The Freedonia listing site offers, as does our shop, a variety of goods in fields as varied as tribal Art, books, tools, orientalia, Americana, nautical and vintage household items. We attempt to describe our listings with great care, hoping that there are no suprises for the purchaser. Sometimes our thorough descriptions make the object sound worse than it is. Get images that make Supersized seem small. Tailor your auctions with Auctiva's. The item "EARLY 18TH CENTURY DUTCH BLACK GLASS ONION WINE BOTTLE" is in sale since Friday, January 18, 2019. This item is in the category "Collectibles\Bottles & Insulators\Bottles\Antique (Pre-1900)\Utility & Black Glass". The seller is "freedonia" and is located in Wiscasset, Maine. This item can be shipped worldwide.